To abandon oneself while scrupulously respecting certain codes: is it possible for us, Westerners, to reconcile these two imperatives? And, assuming we get there, do we feel pleasure? In each chapter of The Japanese Garden, a book made of images and texts, Zenist Sophie Walker emphasizes the tension between these two commandments - the word does not seem too strong as the discipline governs the imagination and the development of a garden in Japan. After a moment of astonishment at reading the myriad of principles to which the arrangement of the stones obeys, we realize that it is not surprising that the Japanese garden is saturated with both rules and nuances like everything else in Japan. Is it perhaps the condition of existence of refinement? Unlike the vast lawns of the western garden, where one can freely frolic and picnic, the Japanese garden decides how we experience it. Some are designed to be "contemplated from afar," they call them "unenterable gardens" and a chapter is devoted to them. Others can be surveyed as long as they follow a defined route. 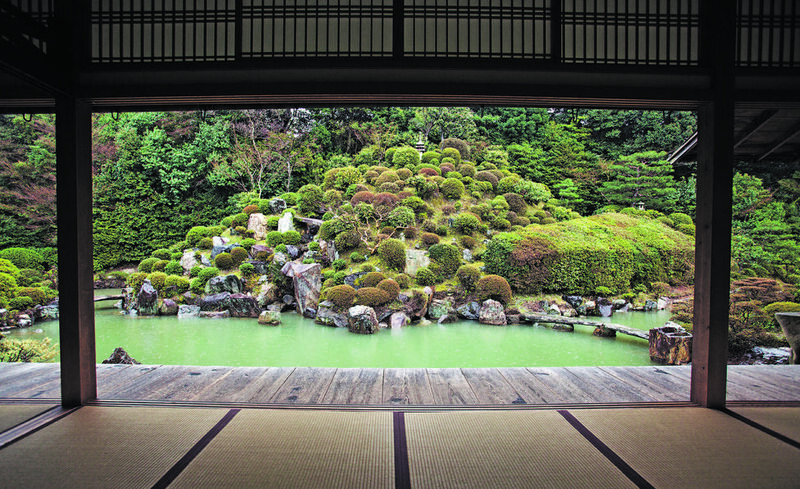 "Entering a Japanese garden is like entering a place of worship," writes Sophie Walker, who decrypts Buddhist principles from different gardens. They are very numerous and the author diffuses them as clearly as possible. The physical experience of an informed visitor doubles as a spiritual experience. Sophie Walker gives a lot of information on the state in which one who walks a garden must feel. A coherence emerges: we must become aware of the ephemeral nature of our presence. Even tea - in many gardens is a tea house - is there to remind you of that. A temple, a bamboo plantation, a gravel field, caves, a garden inside a house, a "sea of moss", white sand, a waterfall, a bridge over a pond: the photos and the author's explanations give an account of the diversity of figures and symbols placed by the creators of these gardens. These were often priests. Everything makes sense. Such arrangement of shrubs is a "borrowed landscape", that is to say the reproduction of the view offered from a famous mount. Azalea bushes? They evoke the clouds above the hills, the loneliness, the isolation necessary.